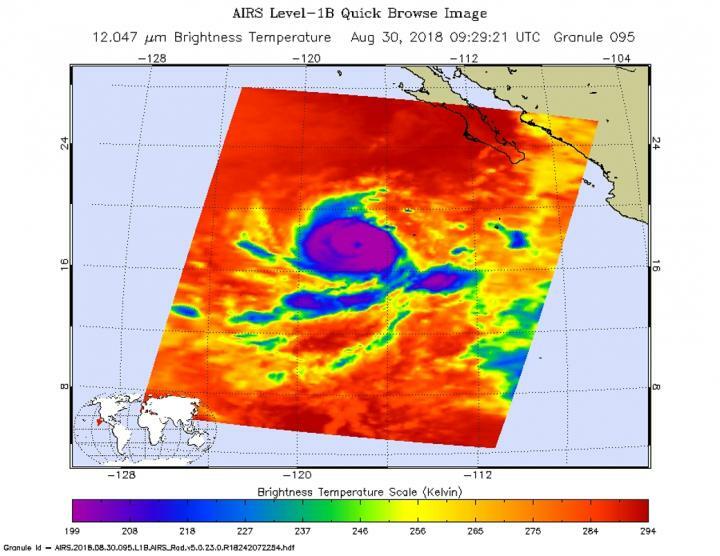 When NASA's Aqua satellite passed over Hurricane Norman on Aug. 30 infrared data showed very cold storm tops around a 20 nautical-mile-wide eye. NASA's Aqua satellite passed over Norman on Aug. 30 at 5:29 a.m. EDT (0929 UTC). The Atmospheric Infrared Sounder or AIRS instrument analyzed the storm in infrared light which provides temperature information. Temperature is important when trying to understand how strong storms can be. The higher the cloud tops, the colder and the stronger they are. On Aug. 30 at 11 a.m. EDT (1500 UTC), NOAA's National Hurricane Center or NHC noted Norman had rapidly strengthened during the past 12 to 24 hours, with the development of a well-defined 20-nautical mile wide eye and a thick ring of cold cloud tops of minus 94 to minus 121 degrees Fahrenheit (minus 70 to minus 85 degrees Celsius) Storms with cloud top temperatures that cold have the capability to produce heavy rainfall. The eye of Hurricane Norman was located near latitude 17.8 degrees north and longitude 118.0 degrees west. That's about 630 miles (1,015 km) west-southwest of the southern tip of Baja California, Mexico.